Our classic hand-rolled crust, made fresh throughout the day. Gluten Free Thin Crust is available in our Small 10″ size for $2.20 extra. A thick crust enhanced with a touch of milk, honey, and cornmeal. Our signature crust, hand braided to order with butter and spices. Add to any pizza for 99¢. A stuffed crust loaded with mozzarella, ricotta, and one Classic topping. 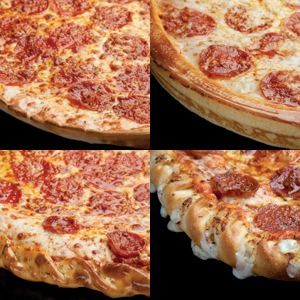 Add for Deluxe topping charge (See Size Chart). All of our pizzas come with Classic Red Cause unless listed or requested otherwise. 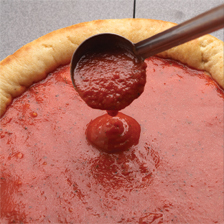 You may substitute any of our great sauces for a Classic topping charge for that size. (See Size chart at top of page). 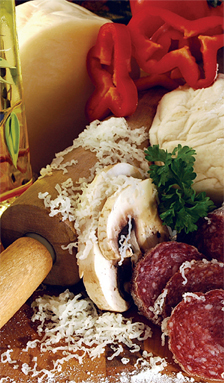 With our large selection of toppings, it’s easy to be creative building your own pizza!